Even though the 9.7" iPad is Apple's most popular model — large enough to watch movies or read books, but still small enough to be easily portable — the 9.7" iPad Pro is getting an overhaul. And the first thing to go is that ever-so-popular 9.7" screen size, replaced by a larger 10.5" model. The screen is 20% larger than the last generation, but the bezel is 40% smaller, so you get more screen without increasing its physical size by much. That means new Pro still weighs in at just a pound while maintaining the same 10-hour battery life. That extra size lets iPad Pros have a full-size on-screen keyboard as well as a full-sized Smart Keyboard (though the latter is still sold separately). Both are excellent benefits from anyone who wants to use their iPad for serious writing work but doesn't want the added size or weight of the 12.9" iPad Pro. Updates for the iPad Pro 10.5" and 12.9"
It’s not all about the 10.5” Pro: both it and the existing 12.9" Pro are getting some updates. It's no surprise that the new Pros are faster, as Apple tends to up the speed of its gadgets with every incarnation, but the new versions are definitely faster. The A10X Fusion chip is a 30% speed boost, and a new GPU means 40% faster graphics. The display itself is sharper, too. The new True Tone display is brighter, with wide color gamut and low reflectivity that should have less glare than earlier iPads. A faster screen refresh rate — up to 120Hz — will make games and video look smoother than ever. And Apple has already foreseen the downside to such a speedy refresh rate: reduced battery life. So the iPad Pro will adjust the refresh rate depending on what you're doing. That means the refresh rate can crank itself up to a full 120Hz when you're playing video games but drop down when you're browsing still photos, saving battery power. This faster refresh rate also makes the tablet feel more responsive, especially when working with the Apple Pencil. The updated iPads are available for sale now, but won't ship until next week. All models now start with 64GB of storage standard and go up to 512GB. The 10.5" starts at $649 (a bit more expensive than the 9.7" model) while the 12.9" starts at the same $799. However, the Pro's best accessories are still sold separately: the Apple Pencil costs $99, while the Smart Keyboard costs $159 for the 10.5" version or $169 for the 12.9" version. That can really add to the cost of your new iPad, but if you intend to draw or type a lot, these are the best accessories of their kind for your new iPad Pro. Though iOS 11 isn't due out until this fall, it's the biggest update Apple has ever done for the iPad — and we're already looking forward to it. The focus is on productivity, with a redesigned dock that works more like the macOS dock. You'll be able to switch apps by tapping on an app in the dock for speedy switching or dragging an app from the dock to go split screen for multitasking. 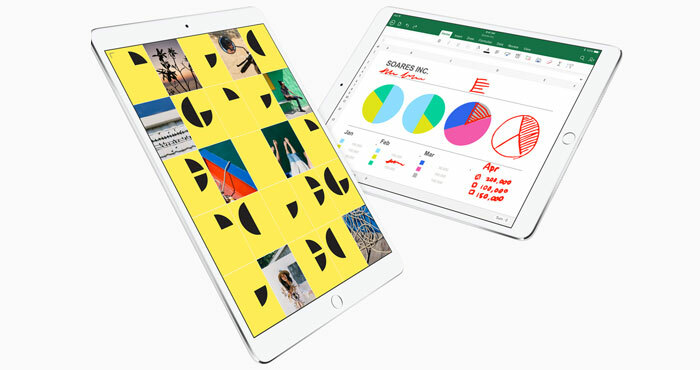 The new ability to drag and drop text, photos and files feels long overdue and works great alongside the tablet's improved multitasking features. And, while it's not a big change, the keyboard has been updated to let you access letters, numbers and symbols with a gesture, without switching keyboards. It's a simple change, but one that will save iPad and iPhone users a lot of time. A file manager is another feature that feels well overdue. 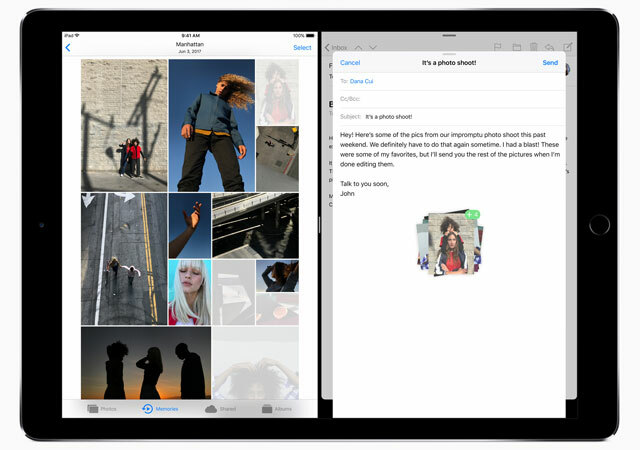 The new Files app lets you see all of the files on your iPad or iPhone all in one place. But it also syncs across devices, so you can find things on your iPhone from your iPad or vice versa. In addition to iCloud Drive compatibility, Files will work with third-party storage services including Box and Dropbox, a pleasant surprise when so many Apple apps only work with other Apple apps. The Apple Pencil gets a boost from these software updates, too. Tapping on your lock screen with the Pencil will automatically create and save a note, which is perfect for jotting something down quickly. You can also seamlessly add sketches or annotations to notes, images or emails — all you have to do is tap your Pencil to your iPad. And if you take notes by hands using the Pencil, you can now search them. Siri is getting smarter, too. In addition to a voice that sounds more natural, machine learning lets Siri learn about you to anticipate what you want and when. Siri will also be able to do translation: just ask for a phrase to be translated into Chinese, Spanish, French, German or Italian and Siri will write it and say it for you. It's a handy feature for language learning or travel — just remember Siri requires an Internet connection, which means you'll need a data connection when traveling internationally. iOS 11 is already in the hands of app developers, but the rest of us will see it this fall. It will be a free update and, considering Apple's tendency to nag you until you upgrade, there's no way you'll miss out on it. iPad Pro with IOS 11 + Latest Note + Pencil service. For me this is going to help me allot. Removing 32 and introducing 64 with machine sync + MACHINE LEARNING (Personally i don’t like to keep in mobile specifically notification & MSG) + AI. Apple will continue rocking for 2018 And definitely it is a new curve due to which small iOS iphone app development company will struggle and technically capable iOS iphone application development companies will grow.